Found recently at a local 4 days per month open antique store in my neighborhood. The Big one looks like a Kewpie Doll. 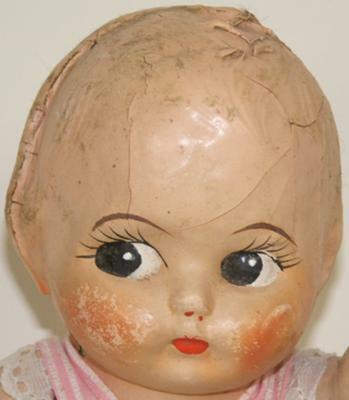 She's 15" tall and made completely out of some sort of plaster that is chipping off. Arms only are jointed. Molded hair. No markings anywhere! 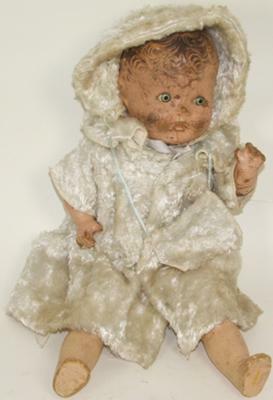 The fur coat baby doll is 14" long with weird, cracking head, arms, and lower legs. The rest is stuffed cloth. There's something inside her that maybe used to say momma, now just squeaks. Sleep eyes on this one. Also big block letters on the back of torso B R U, but she looks nothing like any Bru Dolls I looked at. 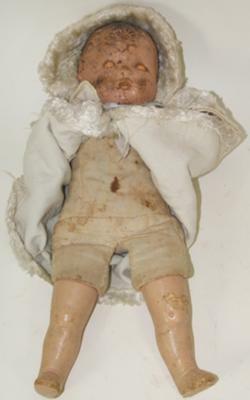 The first doll is a carnival doll and reputed to be made by the Imperial Doll and Toy Co. Circa 1921. 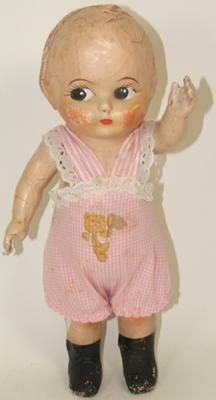 The second doll is from the 1930's with metal eyes. She may be an Arranbee (R&B) Dream Baby as she has the unique forehead curls as picturer on page 26 ot the book: Arranbee Dolls by DeMillar and Brevik. She is made of composition. Try taking a clean damp cloth & wiping the dirt off her face.